Warm weather destinations continue to be popular for superyachts, but many owners are increasingly keen to go somewhere different. The motivation for this might be the desire for something more challenging, more remote or more spectacular – by their very nature these places are likely to provide unusual difficulties. But challenges bring solutions, and one organisation in particular knows most of these solutions. Yacht consultancy and management service High Latitudes, specialising in Antarctica, the Arctic and other remote destinations, was created to ensure owners and crew get the very best enjoyment from their destinations. The company is owned and run by Richard Haworth and Luke Milner, who based the idea for High Latitudes off of their own sailing and mountaineering expedition experience in Antarctica. He then went to work as a skipper on charter yachts such as Pelagic and Pelagic Australis, taking people to the Antarctic and the Arctic. After six years, eager to spend time leading a ‘normal life’, he and Milner saw an opportunity to use their experience to help other people visit these remote places, and created High Latitudes. When Haworth and Milner meet owners or captains, initial discussions are about where they would like to go and when, and what they would like to do when they get there. It is not uncommon for small changes to be proposed, perhaps for reasons of safety but often in an attempt to maximise potential enjoyment. 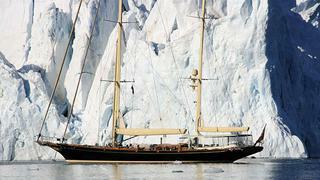 The next stage is to consider the yacht intended for the voyage. In an ideal world this discussion would occur before she is built, to ensure all High Latitudes’ proposals could be incorporated. Although this has been the case on a handful of Oysters – semi-custom sailing yachts with fundamental limitations regarding potential alterations due to their standard GRP hulls and decks – only recently has an opportunity occurred to significantly influence a boat’s design. When Haworth first met the owner of Bougainville, a 22-metre aluminium cruiser-racer currently in build at Claasen Shipyard in Holland, he suggested, as he often does, that the waterline should be raised to allow for the extra weight of equipment needed for the proposed voyage to the Antarctic Peninsula. But the owner went one better – asking designer Berret Racoupeau to redraw the underwater lines and give the boat more buoyancy to carry the increased payload. Good insulation is obviously vital to cope with extreme temperatures, and Bougainville’s insulation specification was upgraded on Haworth’s advice – but it would be a huge job to make any such improvement on an existing steel or aluminium boat. ‘We are particularly interested in things like stabilisers, to make sure they don’t protrude too far and [to manage] what would happen if they hit something with one of them,’ Haworth comments, ‘and propellers as well.’ Another major consideration is ground tackle – anchors need to be much heavier and chain much longer than for conventional anchoring situations (see later for exactly why). But it can sometimes be the case that, even if there is room for more chain, it would seriously affect the trim of the boat. The Nicholson gaff cutter Merrymaid – built in 1904 and so an extreme example of a boat High Latitudes couldn’t get involved with early enough – is currently undergoing an extraordinary eight-year, 90,000-mile circumnavigation. Haworth advised on the preparation for parts of this voyage, and joined the boat himself in the Falklands, spending six weeks on board as they sailed through the Beagle Channel and up the west coast of Patagonia to Puerto Montt. ‘All the changes Richard proposed were carried out, except for the wooden covers of the doghouse windows that proved to be too bulky on a boat with little storage space,’ Merrymaid’s owner remarks. 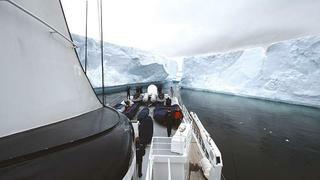 There was very little advice High Latitudes needed to give regarding the suitability of 54-metre motor yacht Itasca for her 2009 voyage to Antarctica. Not only was she built as a salvage tug, but had also been there on three occasions since she was converted to a superyacht. But they could advise on preparations for the trip, if not how to refit the Itasca for the cold.